Why choose American Parks Company for your playground project? At American Parks Company, we believe that quality, selection, and price are the three most important things that our commercial playground customers need to help them make the right choice for their recreational project. That’s why we carry a broad range of products from the best American playground manufacturers, we can suit any theme and budget. 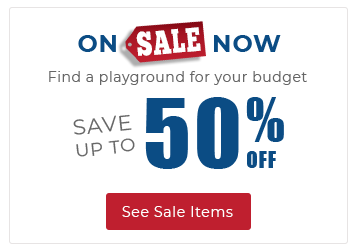 We know purchasing a playground is a big decision. Our website is designed to offer our customers the convenience of selecting a variety of commercial play structures, independent play items, fitness equipment, educational activity and learning panels, and much more from domestic manufacturers we know and trust. Simply stated, we offer the best quality at the best price. What happens if you don’t see something you like? Allow the play experts at American Parks Company to help you customize a playground structure or component to suit your needs. All of the play structures show a “Custom Colors” option, where you can make any individual component a color of your choosing, but did you know that we can also re-configure the play activities to suit your unique project needs as well? Allow us to generate 3D renderings and suggest modifications that will suit your intended use for the playground and the footprint you need to fit your space. If it can be found in a park or a playground, chances are we sell it. We have helped thousands of public and private schools, churches, daycare centers, city and state parks, homeowner associations, apartment complexes, and other organizations to select, design, purchase, and install high-quality commercial playground equipment. This includes aftermarket swing set replacement parts, site furnishings, safety surfacing materials, resources for playground safety inspections, and much more. If you are looking for pre-fabricated steel shelters or fabric shade structures, picnic tables or outdoor benches, recycling and trash receptacles coordinated to match, we have those too; and they are backed by the same industry-leading warranty. American Parks Company does business coast-to-coast to create fun and engaging playgrounds that last. Our nationwide network of certified installers allows us to offer turn-key installation services on all commercial playgrounds, pre-fab steel shelters, and shades across the continental United States and some outlying territories. We also offer freight forwarding services to our international customers. Buy from a name you trust with the certified expertise you need for a quality installation. Our professionals meet the requirements and standards set by the National Certification Board and National Playground Safety Institute Executive Committee, and our playground installation technicians are Certified National Playground Safety Inspectors (CPSI). American Parks Company also employs Certified Playground Safety Inspectors on our sales and customer support staff, to ensure that every playground meets required state and federal standards for safety and durability. The commercial playground equipment we distribute meets the rigorous safety standards of the American Society of Testing Materials (ASTM) and the Consumer Product Safety Commission (CPSC). We put safety, learning, and fun first at American Parks Company. Every commercial play structure is designed to be inclusive, offering access and play activities to children with unique mobility needs. The federal mandate of the Americans with Disabilities Act (ADA) of 1990 requires that public playgrounds be accessible so that every child can enjoy the fitness, learning, and social benefits of play. Not sure how to get your playground ADA compliant? Ask us for more information on designing an ADA accessible new playground, or modifying your existing playground for federal compliance. At American Parks Company, we work hard to ensure that every customer’s park or playground project is a positive experience. In fact, we earn great feedback and referrals from our customers every month! How do we do it? We hire the kind of sales, service, and installation staff that is committed to providing a great user experience for our customers. Our friendly and knowledgeable playground specialists will work with you and address your organization's unique project needs and concerns. We work hard to get you the best value for your playground budget while providing personalized customer service each step through the design, purchase, and installation process. Once completed, our entire team (from sales to service) remain available to support you throughout the life cycle of your playground equipment. We also offer annual safety inspection services and expert advice on playground maintenance. When it comes time to purchase your next playground, you can rely on American Parks Company for all your planning, design, procurement, service, and installation needs. America is experiencing a recreational renaissance with the understanding that parks do more than provide an environment for fun and play; they also provide learning, fitness, and community building opportunities. With over 25 years of combined experience in the playground business, we have helped thousands of public and private institutions build engaging indoor and outdoor recreational spaces. We are fully committed to building spaces that encourage families and children to play outdoors, make new friends, and create great memories. Stay up-to-date by connecting with any of our social networks. Or see what's on our mind lately by reading one of our recent blog posts.